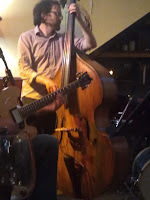 Gavin Barras Bass, Jeff Guntren Sax, Jim Faulkner Guitar, Dave Walsh Drums. It is not often that a non-performer steals the headlines at a jazz gig but I think that most people in the audience on Friday night would agree that the real star of the show was the double bass and its creator- band leader Gavin Barras’ father. The beautiful instrument had been lovingly built over a course of 15 years. Parts of it were even made from the eaves of Barras’s childhood home. Still I guess Barras needed a new one as his previous instrument was over 200 years old. In honour to his father, family and double bass, the quartet’s latest album is called Family Tree. A selection from this album, along with some standards, provided the material for this highly enjoyable evening. Fittingly, proceedings kicked off with a song dedicated to his father Steve’s Song but there were also two waltzes dedicated to his significant others: Waltz With my Wife and new baby son Swingin’ Charlie. The standards played included Caravan, a Monk tune and finished up with a lively version of St Thomas. Excellent support work and some fine solos were provided by guitarist Faulkner and drummer Walsh. Guntren on tenor who hails from Sioux City, Iowa USA, although now resident in Manchester UK, was a revelation. I can’t remember the last time I enjoyed listening to a ‘straight ahead’ sax player so much, both his tone and content were immensely impressive. 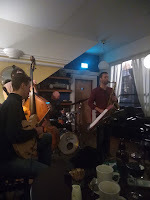 For someone who tends to focus more on the free improvised jazz scene, I was pleasantly surprised as to how much I enjoyed this gig and would be very happy to see them again should they grace this region in the future.